Read all about what we have been doing in classes 4, 5 and 6. In class 6 we have been learning about healthy living. Healthy eating is an important part of healthy living. We have designed and made pitta pizzas. Today we made them, cooked them and ate them. we all tried something new on our pizza that we thought we might not like. Only three children said they did not love their pizza! What a success. these pictures were all taken by a member of our class. well done-he could be our professional photographer. This afternoon we invited parents in to help us with our learning. We just want to thank everyone who came in and we hope that you enjoyed it as much as we did. We have been on a mini bug hunt in our school grounds. We looked very closely using magnifying glasses and then looked up information about the creatures we had found. Lastly, we put them back where we had found the. They were AMAZING. Democracy in Action - Today the children in Y4 voted for the two acts that they would like to see go through to the School's Got Talent final. After they voted, we talked about the democratic process. A big well done to all the children who stood up and entertained us today - you were amazing. We have been studying the history and geography of our local area in years three and four. Today we went on a walk to look at the different types of buildings, land use and to see some of the history of the area. We saw parks, fields, churches, shops and businesses. We saw where the original Round House used to be and the big house it was the lodge for. We saw where the railway once ran and the Station House. Across the valley. we could see Barnsley College, the hospital and even the Town Hall. Luckily, it as not quite so hot today! Today was the Easter bonnet and egg competition. Look at our fantastic entries. Class 5 have researched and designed torches and now we are making them! Class 6 have been learning how to draw emotion, as well as make our facial sketches more detailed. Can you spot what we have changed between our two images to show different emotions? Class 6 have been sharing their favourite books with each other for world book day. There was a huge mix of genres and authors, from Captain Underpants to Goosebumps! For WORLD BOOK DAY we have all brought in our favourite book to share and read. One young man even knows the author of the books he brought in! We have started work on making and testing electrical circuits this week so that we will be able to design and make our own torches after the holiday. In class 5 we have been busy playing the part of councillors and protesters. The councillors were listening to the proposals being made by the 'Save Our Hedgehogs' protest group. They wanted to suggest ideas to the council to help protect hedgehogs as they cross a busy road. Then, after listening carefully, the councillors have recommended that they write to the planning department with their ideas. Watch this space to find out what happens next! Today year 3 were visited by the fire service. they have learned a lot and also had lots of fun. but they have got homework to do. we hope their mums and dads can help them out with it because they get a certificate if they bring it back in to school. Can you tell an obtuse angle from an acute angle? Or a reflex angle from a right angle? We can. We used what we knew about angles and shape to try a mastery activity. Team Activ have been helping us to develop our gymnastics skills. Look at how amazing we are! Want to know how to stay safe on the internet? Ask the SMART crew in class 5. We have been using our science work on light and shadows to help us tell stories this week. Using torches and card shapes on sticks we could tell our stories as shadow plays. In maths this week we have been constructing 3D shape skeletons. The number of straws we needed told us how many edges there were on the shape and the number of blobs of plasticine we needed told us how many vertices the shape has. Can you name any of the shapes we made? Years 3 and 4 have been very busy creating clay master pieces this week. Class 6 had pictures of nine famous people. Working in groups, they had to order them with the person/people they most admire at the top and the person/ people that they least admire at the bottom. They then had to share their ideas with the rest of the class. In class this week we have used our maths skills, geography and ICT skills. We used what we had learned about negative numbers, using atlases, a globe and the internet to find out the temperatures at various places around the world. Then we found the differences between these temperatures. Ask us if you want to know the difference between the hottest places and the coldest places on the planet. A HUGE thank you to all the parents who came to our maths learning morning. We hope you enjoyed it as much as we did. 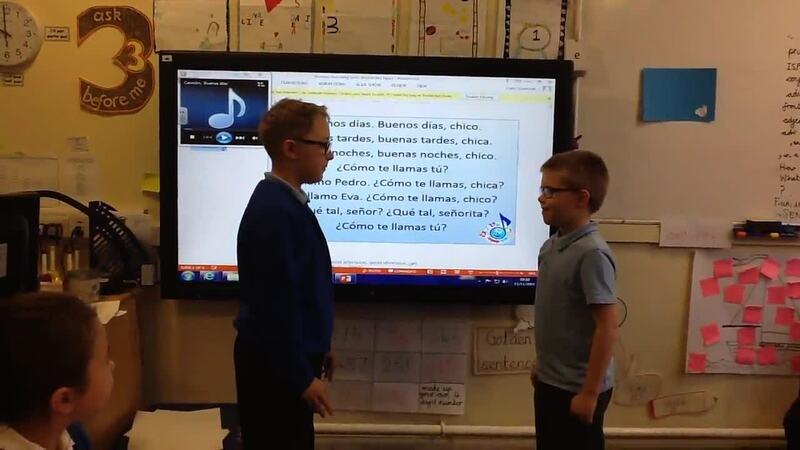 In Class 5 we have been practising greeting each other in Spanish. We can say "hello", "goodbye" and ask how someone is. We played a game to help us remember the Spanish numbers and animals names we have learned. This week we took our experimental archeology outside. We found out exactly how difficult it must have been to live in the Stone Age and have to build yourself a weatherproof shelter. ...but first we had to make the rectangle using all of the straws we had been given. We have been learning about prehistoric homes. We have been outside collecting natural materials that we might need to build them. It is a tricky job and harder than we anticipated. We can only imagine how hard it would have to construct the real thing. The Mastodons have been learning to use the bar method to understand word problems. They were asked to show, in different ways; "There are 3 cars in a car park. During the day, 6 more cars park. How many cars are there now?" Look how many different ways we can interpret that number story! Classes 4, 5 and 6 are extreme readers! Year 3/4 are having a competition to see who can read a book in the most exciting place possible. Even before Mr. Horton got a chance to show his entries, there were already photographs being brought in from home. Any new entries will be added to our slideshow - see if you can spot anyone you know! Class 5 want to share their love of reading so they have teamed up with class 2. Some of us like to read alone, some like to stretch out and get comfortable, some of us like to sit at a table but we all LOVE reading. Look how hard we work in Class 6! We have been creating Stone Age timelines to show key events on our topic display. We had to remember the key dates and events that make up the stone age. The Mastodons have been using our skills with the tens units to lay out our column addition. We needed to write out the sum on our whiteboard and represent it using the units on our table. We could see how ten units make a ten and ten tens make a hundred. This week, in our forest schools lesson, Class 6 have been gathering natural materials that we could find around us, as well as creating a gradient using different coloured leaves. We discussed why leaves turn a different colour in the autumn, as well as looking into why different types of plant (such as fungi) grow really well in the dark, damp forest area of our school. Mr. Horton's Maths Mastodons have been looking at place value this week. We were trying to make as big a number as possible using three digits and showing the numbers using our tens materials. It wasn't always easy to do at first, but once we started to spot the pattern it became really simple! We have been using A.L.E.X and Kodable to help us learn. We can create code to move objects around the screen. A lot of determination was needed to get it exactly right, but none of us gave up. 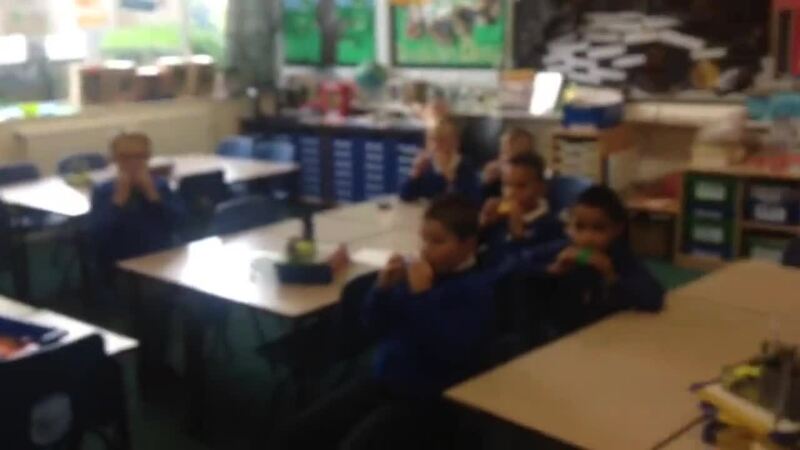 Class 5 have now made musical pipes. It turns out that short pipes make the highest pitched sounds and longer pipes make lower pitched sounds. We have been investigating sound. In class 5 we have made our own guitars with elastic band strings. It turns out that the smaller elastic bands are stretched tighter and make a higher pitched sound. Fabulous trip to the EIS Sheffield! Everyone had an amazing day and met some sporting superstars along the. way! Class Five have been busy creating Money Containers in Design and Technology. They now know how to sew and apply fastenings to the purses and wallets to keep their money safe. Class 4 has been learning all about the human body. Recently, we have been learning about how our digestive system works! Wow! We had lots of fun making our own model of a digestive system! Especially, the amazing body parts we made! Now the weather has started to improve, Class 4 have been able to head out into the woods and practice their knot tying skills! Here are some of the children working in teams to make their best secure knots! Children in years 3 and 4 are learning all about healthy lifestyles and keeping fit. Class 6 tried different types of bread and evaluated each one. Very soon they will have a go at baking their own bread and will make a healthy lunch! Watch this space for more on our exciting, new topic! Miss Smith's maths group have been learning all about capacity! As it was world book day, we travelled to the Athersley South potions lab! We created an incredible invisiblity potion and a fabulous flying potion...Remembering to measure all our ingredients in ml and l! Here they are creating there magical measurements! Classes 4, 5 and 6 had an amazing time learning all about Indian Food...Here is the Chicken Dansak we learned to make! It was definitely very yummy! Class 4 have been discovering the wonders of India...we are comparing life in Athersley to life in India! Here is our recent trip to an Indian Village (in our heads!) Class 4 have a fantastic imagination! It really looks like we are in an Indian Village! Class Five's Egyptian Jewellery is finished, at last ! Class Five have been designing and making Egyptian Jewellery. Miss Smith's maths group have spent the week using money at the class 4 shop. Pupils have taken it in turns to be the shopper and shopkeeper...all the correct change was given and we are now feeling very confident for our next trip to the shop! in a Co-op poetry competition. This week the children in year 4 had a visit from the fire service. The children were informed about fire safety and prevention. To finish they were all given a booklet to complete to remind them about how to stay safe in the event of a fire. The children all listened really well and asked some super questions! Class 4 have been visited by an archaeologist this week, who spoke to us about the artefacts we found on our school field. Some of the findings could have been up to 100 years old! Class Five have been pretending to be Pharaohs. They have researched the hieroglyphs needed to write their name. They used the hieroglyphs to design and paint a Cartouche for their tomb wall. Class Five have been using the woodland for Forest Schools. Tell your Parents what we were doing. Class 4 enjoyed a fantastic morning of being archaeologists...with many different layers to explore we unearthed a few hidden treasures! Archaeologists use tools called trowels to scrap away the excess dirt...just like class 4 are doing here! Class 4 have had a very interesting morning finding out all about archaeologists and the work they do...Did you know dinosaurs lived long before people roamed the earth? We saw all kinds of fascinating objects discovered from digs, this included cannonballs, arrow heads and even the tops of old smarties tubes? All this amazing information will help us in preparation for our own archaeological dig! Class 6 had a super science lesson investigating forces using Newton meters! Did you know forces are measured in Newtons? The heavier the classroom objects, the greater the force was! Everyone had a great afternoon. Our new topic is Ancient Egypt. Class 6 have been busy making binoculars ready to be Egyptian explorers on Friday! Class 5 have been designing and making Pop -up Books. They know all the Technical Words for all the folds! This week children in class 6 have been learning all about persuasive texts. They studied adverts and then created their own advert for a new chocolate bar or sweet product. Take a look at their amazing videos! A group of children from Class 5 were carefully planting beans and courgettes in their class gardening bed this morning. 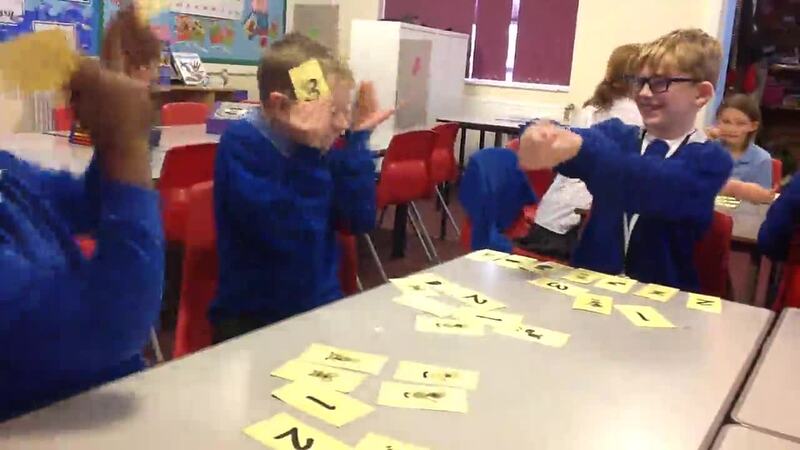 Children in Miss Milner's Maths set have been learning about Roman numerals. Did you know Roamn numerals do not have a 0 in them only I, V, X, L, Cand M. We have learnt how to tell the time on a clock using this ancient time telling method. Children in Years 3 and 4 had a fabulous visit to Magna Science Museum. Everyone learnt so much and had lots of fun too! The children behaved superbly and a great time was had by all. Watch out for some super news reports next week! Class 6 have been very busy getting their gardening bed up and running this week. We are growing peas, spring onions, lettuce add beetroot. We will post pictures of the growing process over the next term and we will hopefully have lots to sell at our Summer Fair! Children in class 6 are really enjoying the 'forest schools' work! Every week the class go into the woodland area for a new forest schools challenge. Here children are playing hide and seek! I wonder who managed to find them? Keep your eye out for some fantastic sculptures and bug hotels in the woodland area next term that classes 4,5 and 6 will be making. Class 5 have been designing and making Torches. Class 5 have been making Shadow Puppets using opaque, translucent and transparent materials. In badminton Class 4 have been learning how to hit an overhead shot. Class 6 have been very busy creating circuits ready to make a torch! Can you name the different parts of a circuit? Watch out for year 3 and 4s super torches!! Miss Butterwood's Maths Set have been modelling 3D shapes using Art Straws and Plasticine. We had to count the vertices, the edges and the faces. We had to identify the shape of each face. Can you identify the 3D shapes? Dos amigos rapping it out! Emilia y Enrique blasting out a tune!